You own a growing business, which is based on recurring revenue and transaction processing. You outsource billing and collections services, but feel that you could save your company’s money by either bringing part of the operations in-house or by optimizing your outsourcing arrangements. Perhaps, you even contemplate about capitalizing on your industry experience, by providing billing or collections services yourself to others in your industry, but the complexity of the infrastructure prevents you from taking the initial step. UniPay can be a great option for you. Processor independence of the gateway will allow you to renegotiate your existing merchant agreements to get better pricing and save on transactions costs. Integration APIs will enable you to quickly link your front-end/POS system to the new backend mechanism. Account management and collections features can guide you in your debt management process. We, as a team, will help you organize the process, reach out to necessary vendors and facilitate any outsourcing that you may elect to use through the network of our partners. 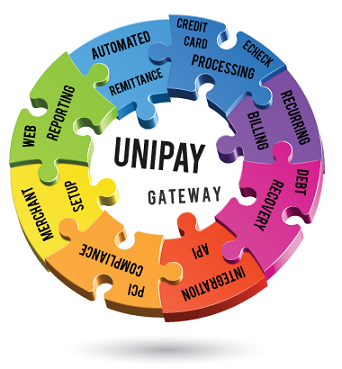 Contact us to discuss your options as UniPay Merchant. Learn how to save on payment processing costs with the right payment processing platform using UniPay Merchant Option.